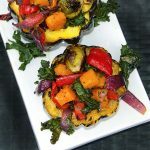 A celebration of fall – a medley of roasted fall vegetables served in roasted squash halves, with pomegranate molasses. A great side dish for a special occasion. 4 tablespoons pomegranate molasses – you can find this at specialty food stores, Middle Eastern Grocers, Whole Foods Market, and sometimes at Trader Joe’s. If you can’t find it, you can substitute 3½ tablespoons good quality balsamic vinegar whisked with a teaspoon of honey or maple syrup. Preheat oven to 400ºF. Prepare the acorn squash Cut each squash in half lengthwise and cut a thin slice off each pointy end, if need be, to create a stable base. Scrape out seeds and strings using a spoon. Place squash, skin side down on a roasting pan. Pour 1/8 of an inch of water in the bottom of the pan to prevent burning. Brush insides and tops of squash generously with olive oil and sprinkle with salt, to taste. Roast for an hour in the middle of the oven, until tender. Roast The Vegetables: While the squash are roasting prepare the rest of the vegetables. You will need a large bowl and two large, shallow roasting pans or jellyroll pans. Put brussels sprouts in the bowl and toss with 1 ½ tablespoons olive oil and ½ teaspoon salt. Spread into a single layer on a roasting pan. Add butternut squash cubes to the bowl with 2 tablespoons olive oil and 1/2 teaspoon salt and toss to coat. Spread out in a single layer on the other pan. Add onions and peppers to the bowl and toss with 2 tablespoons oil and ½ teaspoon salt. Make some room for onions and peppers at one end of each pan. Put trays in the top and middles shelves of the oven. Roast for 15 minutes. Toss veggies and switch the positions of the trays. Roast for 15 minutes more or until veggies are cooked through – peppers, onions and brussels will start to brown. Toss the kale leaves in the large bowl with 1 tablespoon of olive oil and a pinch of salt. Put kale onto a roasting pan and cook in the center of the oven for 15-20 minutes until tender and crisp on the edges. At this point, you can store all the roasted veggies and the squash halves in air tight containers in the fridge for a day. Bring to room temperature before continuing. Assemble the dish Preheat oven to 350ºF. Place squash haves skin side down on a roasting pan. Drizzle 1/2 teaspoon pomegranate molasses over the inside of each squash half. Sprinkle with salt and pepper to taste. Toss all the vegetables gently in a large bowl with 3 tablespoons of pomegranate molasses and salt and pepper, to taste. Mound the roasted vegetables inside each half, allowing the extra veggies to fall onto the tray. Heat for 15-25 minutes, until warmed through. Serve squash with extra veggies mounded on top. Enjoy! Originally published November 2013. Updated October 2018 with added nutritional information, some new photos and some tweaks to the written post.